The prime minister of Iceland has been accused of hiding millions of dollars of investments in his country's banks behind a secretive offshore company. Leaked documents show that Sigmundur Gunnlaugsson and his wife bought offshore company Wintris in 2007. He did not declare an interest in the company when entering parliament in 2009. He sold his 50% of Wintris to his wife for $1 (70p), eight months later. He says no rules were broken and his wife did not benefit financially. The offshore company was used to invest millions of dollars of inherited money, according to a document signed by Mr Gunnlaugsson's wife Anna Sigurlaug Palsdottir in 2015. The leaked documents show that Mr Gunnlaugsson was granted a general power of attorney over Wintris - which gave him the power to manage the company "without any limitation". Ms Palsdottir had a similar power of attorney. Court records show that Wintris had significant investments in the bonds of three major Icelandic banks that collapsed during the financial crisis which began in 2008. Wintris is listed as a creditor with millions of dollars in claims in the banks' bankruptcies. Mr Gunnlaugsson became prime minister in 2013 and has been involved in negotiations about the banks which could affect the value of the bonds held by Wintris. He resisted pressure from foreign creditors - including many UK customers - to repay their deposits in full. If foreign investors had been repaid, it may have adversely affected both the Icelandic banks and the value of the bonds held by Wintris. 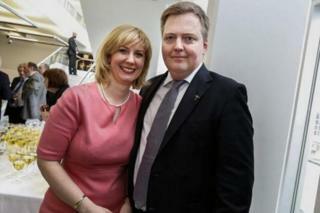 But Mr Gunnlaugsson kept his wife's interest in the outcome a secret. Mr Gunnlaugsson's spokesman said his policies had put the interests of the Icelandic people ahead of the interests of the failed banks' claimants. "The prime minister's wife's losses on these bonds issued by the failed banks will amount to hundreds of millions of Kronur and the scope for recoveries is extremely small." The spokesman said Ms Palsdottir had always declared the assets to the tax authorities and that under the parliamentary rules Mr Gunnlaugsson did not have to declare an interest in Wintris. He said that joint share certificates in Wintris had been issued because the prime minister and his wife had a joint bank account. This was pointed out to them when the documents were reviewed in 2009. "It had always been clear to both of them that the prime minister's wife owned the assets, and this had not changed. Therefore it was immediately requested for the shareholder structure to be mended. All this was made clear in email communications at the time." The revelations are likely to lead to serious questions in Iceland as the leaked documents show that two other ministers in Mr Gunnlaugsson's government also had undisclosed offshore investments.